The Giants and the Jets picked the future faces of their franchise at the 2018 NFL Draft. Here’s how their paths crossed on the night that started their pro careers. ARLINGTON, Texas — A parade of cameramen, P.R. handlers and security guards followed them down a hallway toward the exit at AT&T Stadium, but even two hours after they heard their names called in the NFL Draft, the future faces of New York football couldn’t quite escape the attention. “I knew as soon as I saw the New Jersey area code that they picked me,” Saquon Barkley, in his maroon tuxedo jacket, was telling one final interviewer about the moment the Giants drafted him with the No. 2 overall pick. “It’s going to be a lot of fun to be a Jet,” Sam Darnold, in his blue suit and skinny brown tie, was telling a lone cameraman a few feet away before the No. 3 overall pick was asked to give his first J-E-T-S cheer. Then, they converged, the future face of the Giants and the future face of the Jets, in a freight elevator. Barkley and Darnold had spent so much of this crazy night in each other’s orbit, so maybe it was only fitting that they’d take this ride into the Dallas night and their future together. 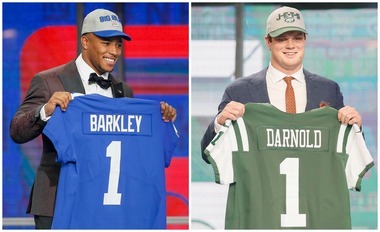 This is not the sort of thing that would have occurred to them on draft night, but it’s true: Barkley and Darnold will be linked for the rest of their lives. If both go onto great NFL careers, it will be seen as a wonderful night for two rival teams that had suffered through some grim days. But if one succeeds and one doesn’t? That will shape the narrative of what happened here in Dallas. The Giants and the Jets haven’t had a draft night like this in a quarter century, and they are staking their future that they’ve found the player who can elevate their franchise to a Super Bowl. Barkley, the experts say, has the talent level of a Hall of Famer like Barry Sanders — although he tried to put an end to those comparisons. Darnold, the experts say, will finally end the Jets’ decades-long quest for the next great quarterback after Joe Namath — although he made it clear he wasn’t worried about those expectations. Their paths had never crossed during their college careers, not with Barkley at Penn State and Darnold at Southern Cal. But the did get to know each other during the pre-draft process that lasted almost as long as the college football season itself. They were among the first to congratulate each other on Thursday night. Barkley was taking a photo with his family backstage at the draft as Darnold, fresh off his bro hug with NFL commissioner Roger Goodell, was walking down the same hallway. The good news for both teams: Barkley and Darnold are accustomed to handling the attention that comes with being high-profile athletes. Barkley has a magnetic personality and an easy demeanor in front of the cameras, while Darnold is polished and knows to avoid controversy. They’ll go their separate ways now. Barkley, who also became a new father this week, will fly to New Jersey to meet his new teammates in East Rutherford and answer the same questions again for a Saturday press conference. Darnold will make the same trip east to Florham Park. Previous articleThese are the 11 most valuable malls in N.J.
Next articleNFL Draft 2018: What are Giants’ biggest needs entering 2nd and 3rd rounds?